In the “Old West”, carrying a large fixed-blade knife in a sheath was a matter of course. You might find the sheath carried on the belt or shoved into the belt or sash. The knives were large, sometimes had a full-tang, and were usually bone-handled. From skinning hides or scalps, the fixed blade knife was the edged weapon of the day. Today, many Law Enforcement Officers and civilians carry knives of one nature or another, laws permitting. When I was an LEO in another lifetime, a Buck 110 resided in an offside carrier. Even though I taught the Lindell Method of Handgun Retention, using a knife to get somebody away from an officer’s firearm was not part of the curriculum. I later taught classes that incorporated the PR-24 side-handle baton, straight baton, and Kubotan techniques with handgun retention. Sometime later, I was fortunate enough to attend a weeklong seminar with Master Dan Inosanto and what I took away from that seminar was priceless. To say that Mr. Inosanto could cut you every way but loose would be an understatement. Dan Inosanto brought edged weapons training to life as well as counter-knife techniques that left me bruised for quite a while, even when training with rubber knives. I carried forward some of the techniques that I learned into the handgun retention classroom and they were favorably accepted over blunt-weapon techniques. Since then, there has been much advancement in the specialty and tactical knife family as well as training in the use of these knives. KA-BAR Knives, Inc., a subsidiary of Alcas Corporation, made a strong entry into the Law Enforcement market with the KA-BAR/TDI Law Enforcement Knife. John Benner, founder of Tactical Defense Institute, designed the TDI Knife. A former Police Lieutenant, Drug Task Force Coordinator, and SWAT Team Tactical Field Commander, Benner has more than 30 years’ experience in the law enforcement field. He has developed courses for raid tactics, defensive tactics and knife programs that are currently taught to law enforcement, military, and civilian groups. Designed by an officer with officers in mind, the TDI Knife is meant to be worn offside and draws like a pistol. In extreme close quarters where a suspect is attempting to take an officer’s handgun, the TDI knife is available as a last defense option. 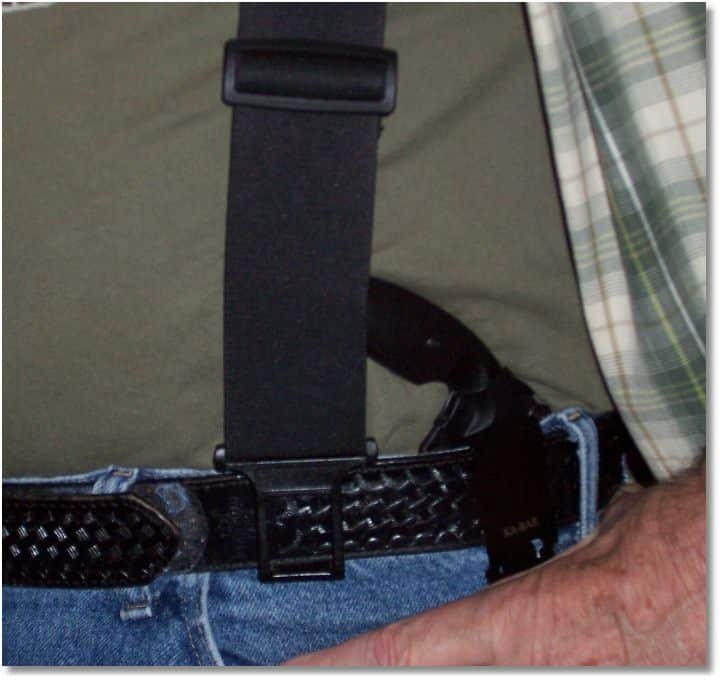 Coupled with a friction sheath, the unit easily mounts on an officer’s pant belt and concealed behind the various gear worn on his duty belt. A non-reflective black powder coated AUS 8 stainless steel blade that features the TDI logo, and a textured Zytel® handle comprises the knife. Paired with the ambidextrous hard plastic sheath the total unit weighs only 0.26 lb. The knife measures 5-5/8” overall a blade length of 2-5/16” long. Straightedge or serrated versions, #1480 and #1481, are available. The knife is made in Taiwan, as are all Ka-Bar knives. Police officers carry their sidearm in a secure holster some of which require a special technique to draw the weapon. Sadly, there have been quite a few cases of an officer shot with his own weapon – on and off duty. 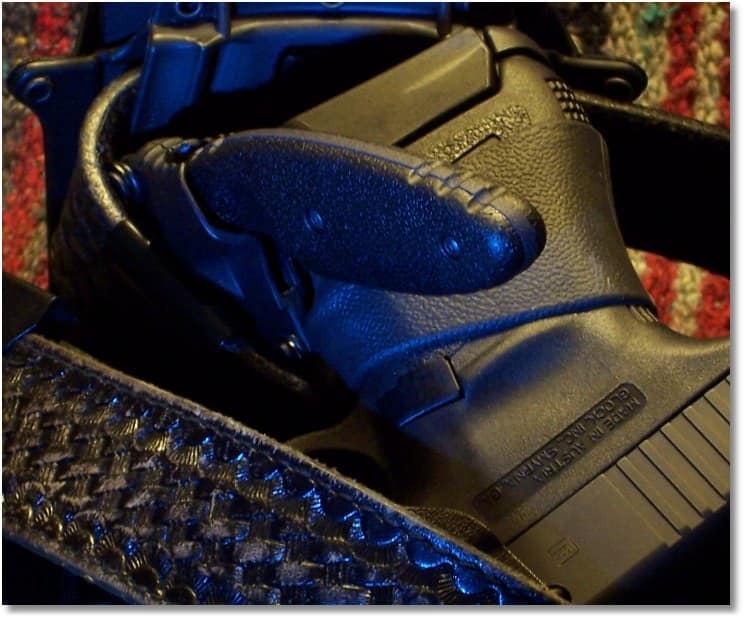 When working off-duty, the LEO is normally carrying his or her off-duty weapon in some type of not-so-secure holster, concealed or not, and these holsters are usually the same as you and I might use. In the back of an officer’s mind is always the thought of someone trying to take their gun away from them and use it against them. Many now carry a knife on duty as well as off duty as a tool to help protect them from losing their firearm to a miscreant. My everyday knife is an Uncle Henry LB3 and a Gerber F.A.S.T with a smooth blade. I had seen a number of small, fixed-blade tactical knives at gun and knife shows but really did not take an interest in them, as I have a good collection of knives. That is until I ran across the Ka-Bar TDI knife. Impressed by the ergonomic design of the knife, I decided to research it further. The edge is ground at the factory and was not as sharp as my preference for a sharp edge dictates. A little honing with the Smiths Diamond Precision Sharpening System took care of that problem. It is now sharp enough to remove some “Dunlop” from my body if I am not careful when drawing it from the sheath. The sheath is made of what looks to be Kydex. The knife inserts only one way in the sheath and snaps in firmly. The sheath has a purchase for your thumb. To properly grasp the knife for a forward blade position, the thumb must be on the sheath and the fingers should be positioned so as when the knife is drawn all fingers wrap around the handle. However, should you decide to pull the blade in the blade-back position (as I do), the knife will pull free of the sheath easily; the bottom part of the hand should rest on the sheath when grabbing the knife to ensure that all fingers wrap around the handle. The sheath-mounting device is a well-made clip that attaches with four very small “Torque” screws. Ka-Bar provides a wrench and a couple of spare screws. The clip mounts on either side of the sheath for a left or right-hand draw. Ka-Bar intends for the knife to be carried “weak” side. The clip itself is metal, can easily slide over a belt up to 1 7/8″, and is strong enough to clip inside the pants. 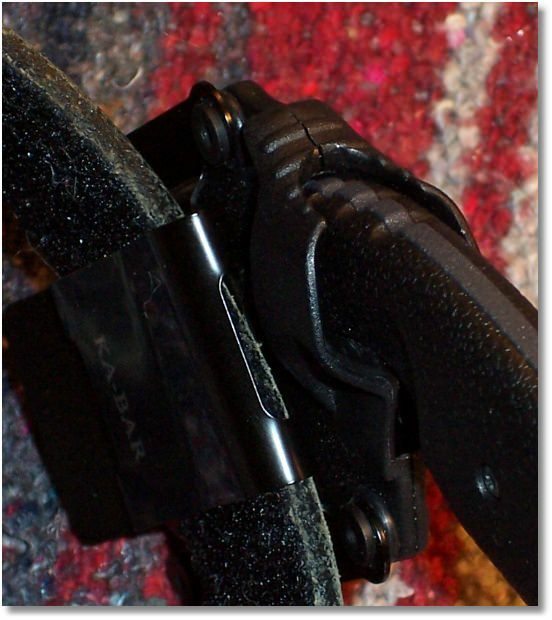 The clip also has a feature that helps to keep it from riding up whether it is belt-worn or clipped into the pants. It fits very well inserted into the pants and then clipped onto the belt. If you have wondered about this knife, John Benner of Tactical Defense Institute has a demo of the Ka-Bar TDI Knife. I hear those saying that no one will ever get close enough to their weapon. Let me emphasize that fact that bad people practice knife techniques and develop gun-grabbing skills. I have seen surveillance videos of inmates at Folsom, Angola, and Leavenworth prisons honing edged weapon skills and practicing gun-grabbing techniques. There are people who will hurt you and hurt you badly. Your job is to get home at night regardless if you drive a company car or a Volvo. There may never come a time when you have to use an edged weapon for self-defense and I sure hope that you do not have to. If you decide to carry an edged weapon for self-protection, get training on its use. Practice with rubber knives in your off-hand in both blade-forward and blade-back positions. At first, it will feel unnatural to you and you must train until it feels like a natural extension of your hand. If you carry a knife for defensive purpose, please do not use it as a box cutter. Keep it in its sheath and only remove it for cleaning, sharpening, or for its intended use. My Ka-Bar TDI knife carried concealed in public, will be as the Katana sword was to the Samurai. The Katana is the sword used by the Samurai (Yes, there are modern-day Samurai and I hope that you enjoy the video in the link). Some believe that one must never ever draw their sword without drawing blood. I carry other knives for more utilitarian uses. The Ka-Bar TDI knife is an excellent product, designed by professionals, and intended to provide you with an edged weapon for the purpose of self-defense. Of course, check the laws before you decide to carry an edged weapon. In the United States, knife laws vary from state to state and even within different cities and counties of the same state. Some local jurisdictions prohibit the possession or use of pocketknives that feature locking blades. Others prohibit certain blade styles perceived by law enforcement and legal authorities as optimal for offensive fighting; a simple pocketknife easily transforms from a utility tool into a deadly weapon.